Fluorescence microscopes use technology that enables them to accomplish tasks not easy to achieve with normal light microscopes, including imaging DNA molecules to detect and diagnose cancer, nervous system disorders such as Alzheimer’s disease, and drug resistance in infectious diseases. These microscopes work by labeling the samples with fluorescent molecules that are “excited” with a laser. This process gives off different colored light that the microscope detects and uses to build images of fluorescently labeled samples, visualizing objects that are 100 to 1000 times smaller than the diameter of human hair. These fluorescent microscopes are expensive, bulky and relatively complicated, typically making them available only in high-tech laboratories. Now researchers from UCLA’s California NanoSystems Institute have reported the first demonstration of imaging and measuring the size of individual DNA molecules using a lightweight and compact device that converts an ordinary smartphone into an advanced fluorescence microscope. Led by Aydogan Ozcan, associate director of the UCLA California NanoSystems Institute and Chancellor’s Professor of electrical engineering and bioengineering at the UCLA Henry Samueli School of Engineering and Applied Science, the research team published its results online Dec. 10 in the journal ACS Nano. The mobile microscopy unit is an inexpensive, 3-D-printed optical device that uses the phone’s camera to visualize and measure the length of single-molecule DNA strands. The device includes an attachment that creates a high-contrast, dark-field imaging set-up using an inexpensive external lens, thin-film interference filters, a miniature dovetail stage and a laser diode that excites the fluorescently labeled DNA molecules. 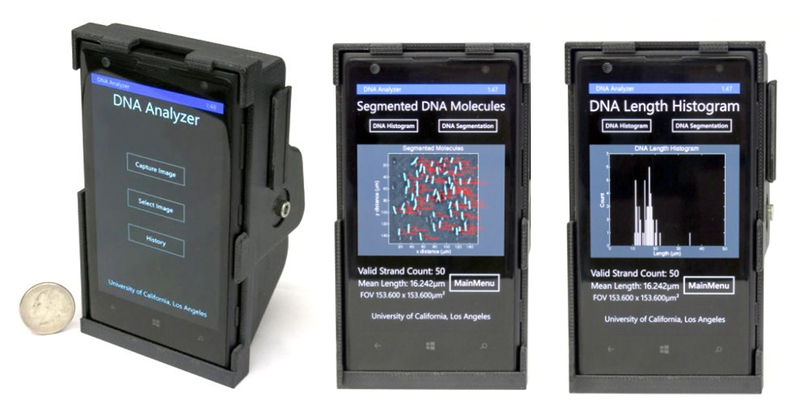 The device also includes an app that connects the smartphone to a server at UCLA, which measures the lengths of the individual DNA molecules. The molecules are labeled and stretched on disposable chips that fit in the smartphone attachment. The application transmits the raw images to the server, which rapidly measures the length of each DNA strand. The results of DNA detection and length measurement can be seen on the mobile phone and on remote computers linked to the UCLA server. “The ability to translate these and other existing microscopy and sensing techniques to field-portable, cost-effective and high-throughput instruments can make possible myriad new applications for point-of-care medicine and global health,” said Ozcan, who is also an HHMI Professor with the Howard Hughes Medical Institute. He went on to say that these devices could have far-reaching positive impact on research and educational efforts in developing countries or resource-limited institutions, helping democratize advanced scientific instruments and measurement tools. Ozcan’s laboratory specializes in computational imaging, sensing and diagnostic devices for various mobile-health and telemedicine applications and the lab’s previous work includes quick analysis of food samples for allergens, water samples for heavy metals and bacteria, cell counts in blood samples and using Google Glass to process diagnostic test results. The first author of this research is Qingshan Wei, a postdoctoral researcher at UCLA Engineering and CNSI, who has been working at Ozcan’s laboratory on mobile-phone based fluorescent microscopy and its biomedical and environmental applications. 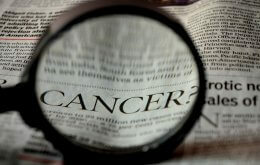 This project was funded by an EAGER Award from the National Science Foundation (NSF). Ozcan’s lab is also funded by the Presidential Early Career Award for Scientists and Engineers, Army Research Office (ARO), ARO Life Sciences Division, NSF CAREER Award, NSF CBET Division Biophotonics Program, NSF Emerging Frontiers in Research and Innovation Award, Office of Naval Research, and the Howard Hughes Medical Institute.